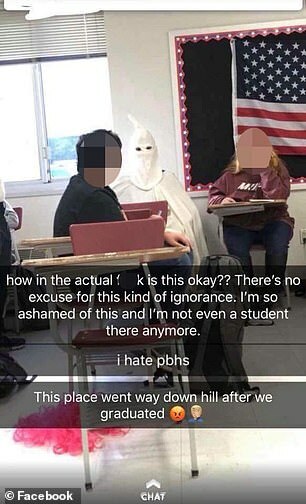 A southern Missouri school district has suspended a history teacher who allowed a ninth-grader to dress as a Ku Klux Klan member for their class presentation. A photo of the student sat wearing the white hooded robes in American History class went viral after an outraged recent graduate who spotted it on Snapchat and shared it on her Facebook page. 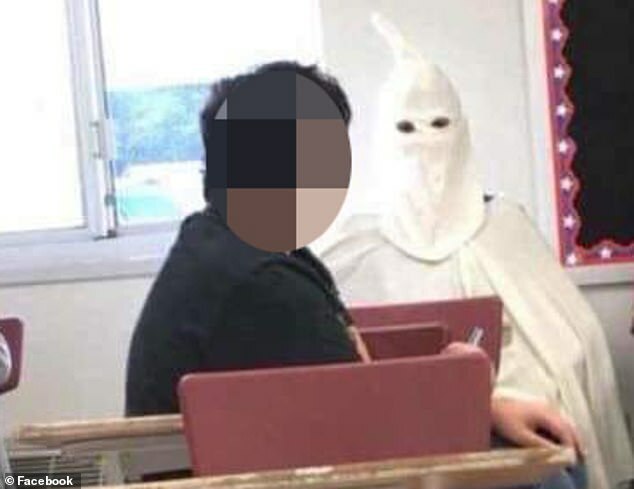 It’s unclear if the teacher directed the student to dress as a Klansman. The district says it doesn’t believe the ninth-grader who put on the offensive costume was acting with discriminatory intent. The Friday class the student had dressed up for had discussed organizations that engaged in voter suppression, during a wider talk about the 15th Amendment, which awarded voting rights to black men, reported the Springfield News-Leader. The teacher who supervised the class, who has not been named by the school citing privacy concerns, has since been suspended. Poplar Bluff district superintendent Scott Dill even visited the class Monday to read the suspended teacher’s letter of apology. ‘There’s no context for this,’ Dr Dill, the superintendent, said of the costume choice in an interview with KFVS12. ‘There’s no point at which anyone in our public school system is going to say that this is okay. ‘I made a mistake on Friday during our skit assignment,’ the missive stated. ‘I let a student wear an inappropriate costume that was unacceptable and hurt many people’s feelings. 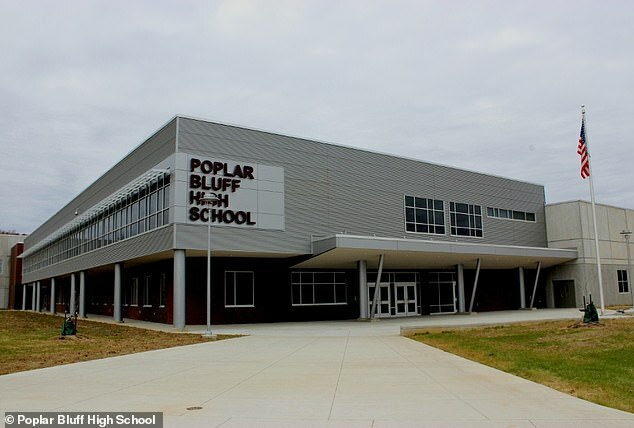 According to records, 85 per cent of Poplar Bluff High School’s student population is white. Just under 11 per cent of the 1,480 students enrolled at the school are African-American and 2.5 per cent are Hispanic.